Two weeks of the Red Laser ‎Golf Outreach Summer Program is now history, with the July segment culminating with a 9 Hole Captains Choice, Developmental Golf Tournament and a free Outreach Golf Clinic for parents with juniors. Red Laser owner Joseph Calauro, and his family, were on hand at the conclusion of the day to welcome participants. 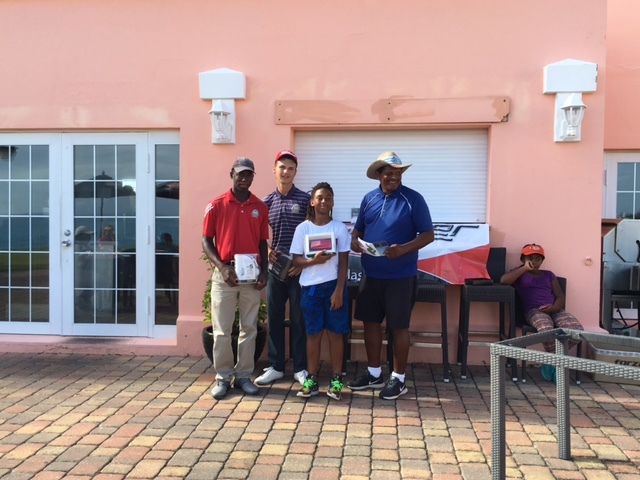 “We thank the parents and children who turned up and participated in the Red Laser Golf Outreach Developmental Free Golf Clinic at Port Royal Golf Course at 3pm Sunday July 24th – this additional feature was a free golf 45 minute golf clinic,” a spokesperson said. “We are most appreciative of the families who stopped by Port Royal and experience the game of golf. The clinic which was conducted by former PGA European Tour Player Kim Swan, who is a teaching golf professional at the Port Royal Golf Course’s Developmental Program. It provided an opportunity for Mr Swan to share his knowledge learned over 45 years competing, with those in attendance treated to a passionate and informative presentation. Weeks 3 to 5 of the Red Laser Junior Golf Outreach are set to ‎continue in August with participation of vacation bible schools, camps and individuals. 1st Place Tied 35 [-1] Samson Douglas, Wayne Daniel‎, Jackson Scott, Zekia Smith. « Column: How Should Bermuda Handle Brexit?